Now that the Kindle, the iPad, and a slew of other e-readers are making paper-bound print increasingly passé, the issue of book paper waste is becoming increasingly salient. 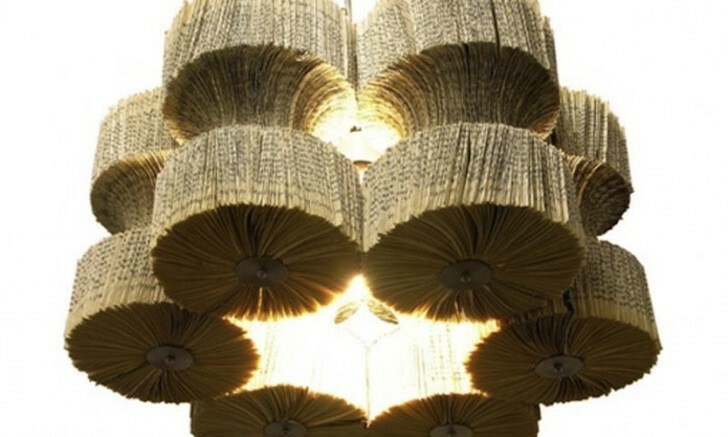 Lucy Norman’s “A Bit of Light Reading” lamp offers a stylish solution to this problem by re-purposing the once-loved pages of your favorite novel into a gorgeous chandelier. Each page is carefully folded in half, arranged, and cut into layered, geometric patterns. If you love this literary light then vote for it in our Bright Ideas Design Competition! Now that the Kindle, the iPad, and a slew of other e-readers are making paper-bound print increasingly passé, the issue of book paper waste is becoming increasingly salient. Lucy Norman's "A Bit of Light Reading" lamp offers a stylish solution to this problem by re-purposing the once-loved pages of your favorite novel into a gorgeous chandelier. Each page is carefully folded in half, arranged, and cut into layered, geometric patterns. If you love this literary light then vote for it in our Bright Ideas Design Competition!